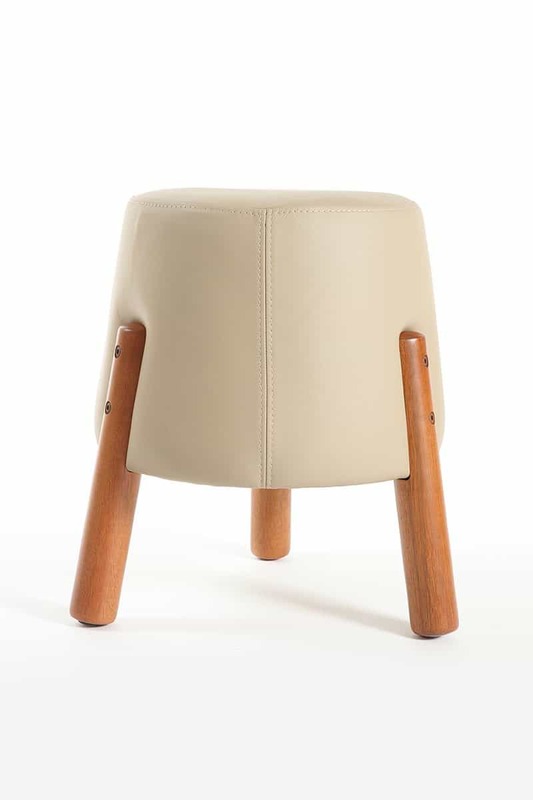 Home » Chair » 20 Amazing Ottomans and Footstools That You Can Buy Right Now! Ottomans are generally round, square or rectangular, with each shape available in a variety of sizes. Round ottomans are great for adding an unexpected shape to a living space with primarily rectangular furniture, while, adversely, square ottomans work well to complement such a layout. A true double-duty furniture piece, ottomans often wear double or triple hats: They can be utilized as a footstool, coffee table, storage container or even additional seating. Because they are available in a variety of styles, colors and patterns, an ottoman, or footstool can also add a touch of character to your bedroom, living room or playroom design. Designs in the shape of a cube are great for sneaking in extra seating space, or to create an extra long coffee table by pushing several together. Rectangular ottomans often double as coffee tables, and can be custom made to fit the length of your sofa. On top of its practical purposes, they are also a great decorative accessory; they often come in bright colors, vibrant patterns or with nailhead or tufted details. that you can buy right now! The Outdoor Wicker Ottoman Pouf will transform your outdoor décor with bright, vibrant color. 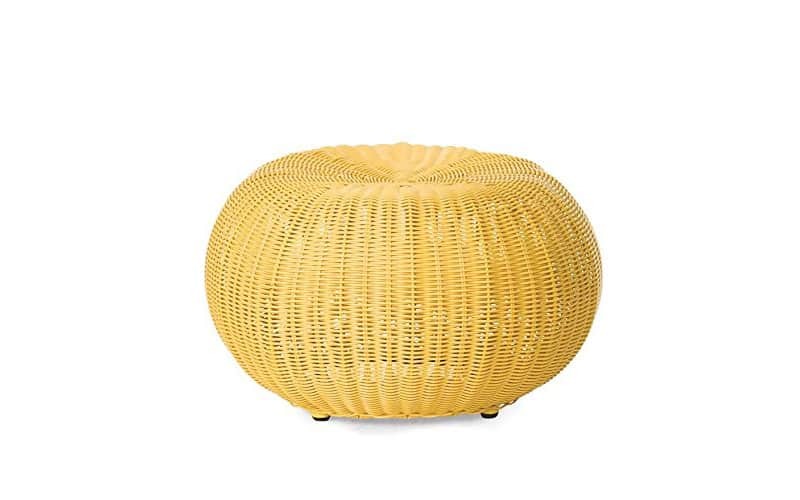 Comfortable and unique, this round Wicker Pouf is suitable for side tables or extra seating. Reinforced with a durable steel frame and made of weather-resistant rattan, our colorful Wicker Pouf adds durable flair to any space. If you admired Keter’s rattan-style furniture with the look and feel of open-weave rattan you are going to love their new knit-style technique mimicking the art and craftsmanship of artisan knit. Keter has outdone themselves this time! 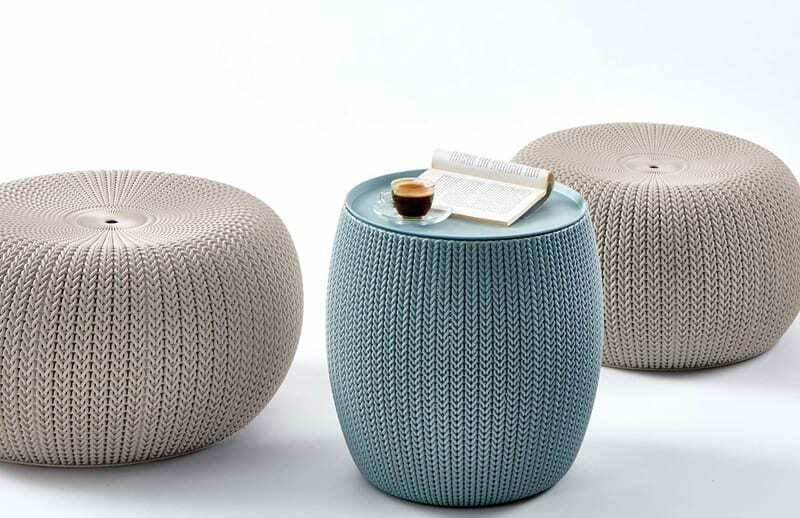 Unique and convenient, the Cozy Urban Knit set from Keter comes with two rounded “pouf” style Cozy seats and one multi-functional Cozy end table/ottoman, which doubles as a storage bin. Ideal for everything from conversation patio set to kids’ tea party to a cozy corner of your living room, this set is both compact and functional. You can sit on the soft poufs and enjoy the great outdoors, or bring them inside for a modern look in any space in your home. The end table allows you to have a surface for holding drinks, snacks, and books, basically anything you need to set on a flat surface. The warm neutral tones and sleek rounded form of this set will blend nicely with a wide array of indoor or outdoor décor. What better way to bring additional seating options into your home, apartment, balcony, dorm room or patio. This Swivel Glider and Ottoman Set will be your favorite place to spend time, relax and soothe your baby. This Glider set features a rotating swivel function as well as a smooth gliding motion. The thickly padded seat cushion, seat back, ottoman and arm rests are made for your comfort. 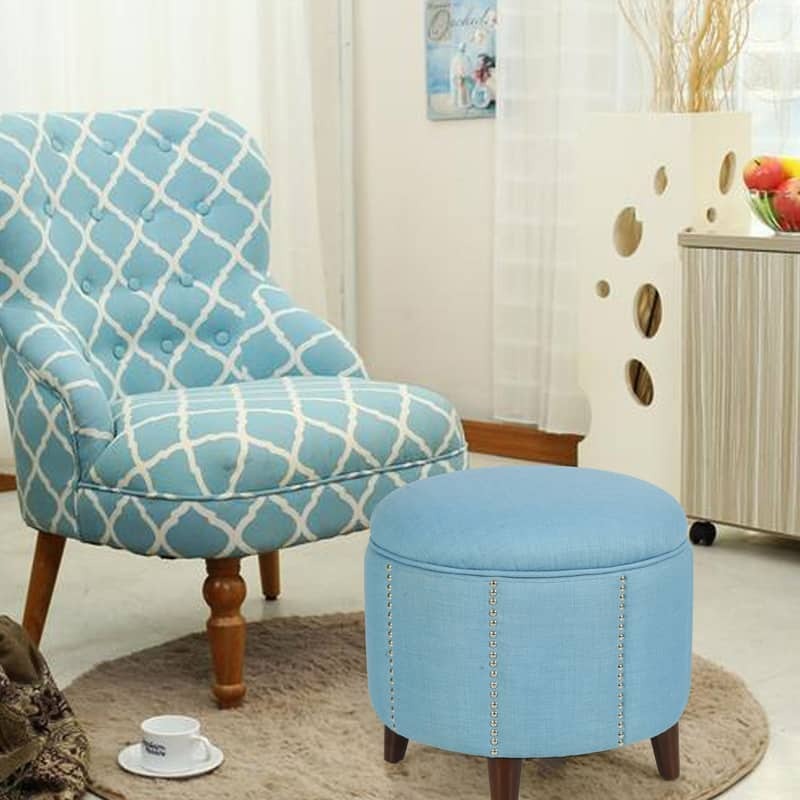 The matching ottoman is perfect for resting your feet too. With all these comfort features, a solid wood frame and a sturdy construction, The Swivel Glider and Ottoman Set will ensure years of happy memories. 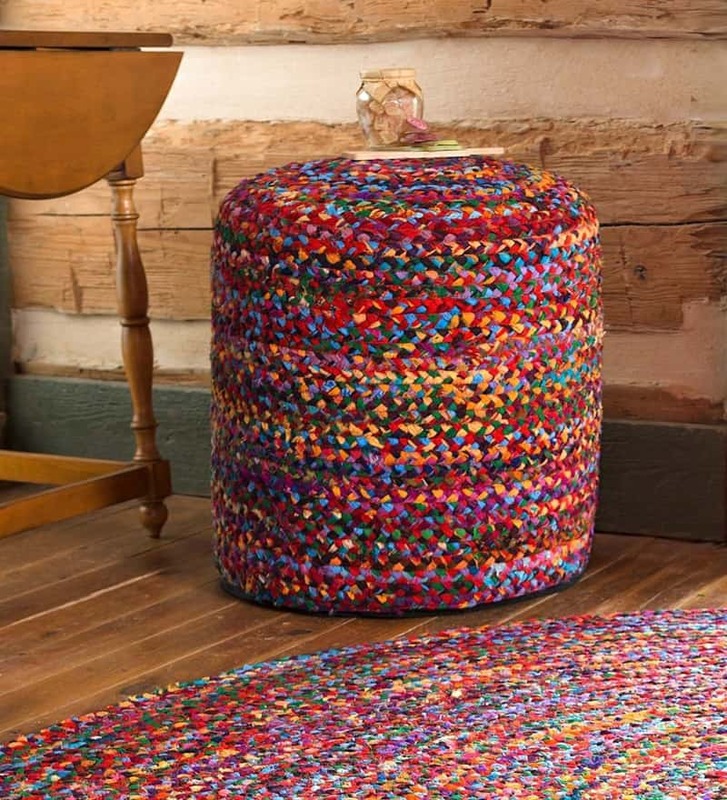 Plow & Hearth Exclusive – Our colorful, hand-woven pouf is a great value with intricate, braided craftsmanship. 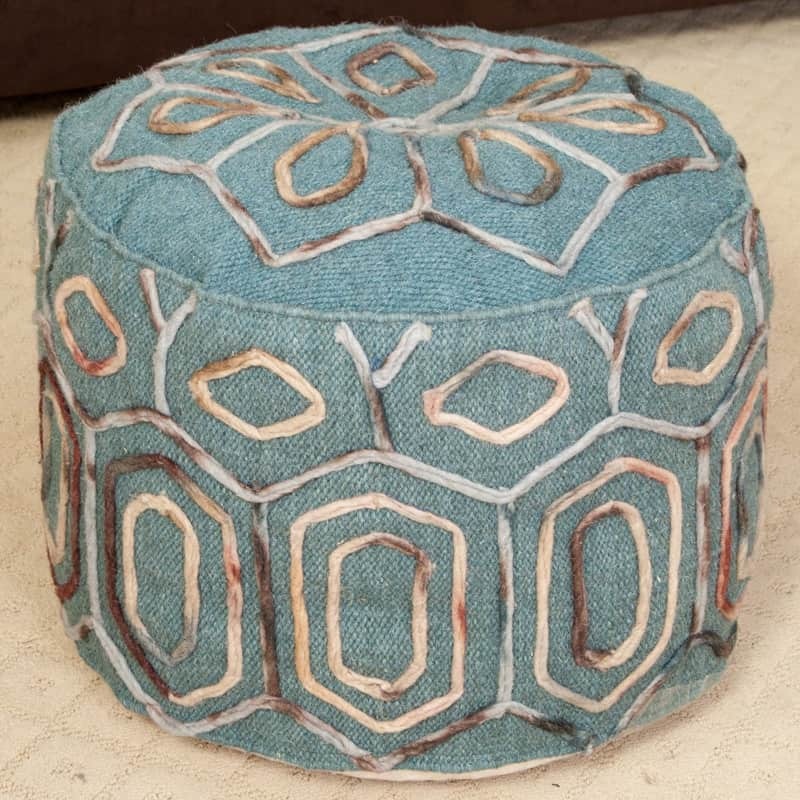 Made from recycled saris, this comfy pouf ottoman have been re-purposed for your life! Multicolored and made of a soft, cotton blend from recycled saris – eco-friendly and authentic. 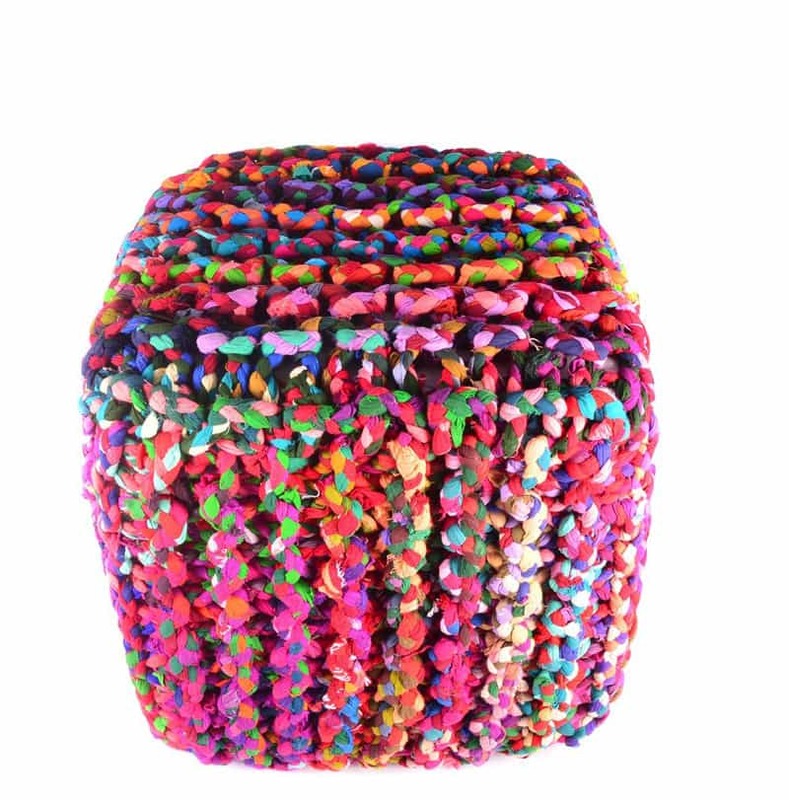 This lovely Pouf is made with braided colored chindi cotton Fabric. Perfect Décor for bedrooms living and dining rooms. Made of cotton. Easy care, to clean simply shake out or vacuum. We thrive on our selection of handcrafted rugs and handcrafted glass candle votives. The products showcase a wide variety to products that can fit well in home at very economical prices. A practical addition to any home, this amazing furnishing helps keep your living areas organized while providing extra seating for unexpected guests. Add to cart now and start enjoying this handy storage and seating solution for years to come. 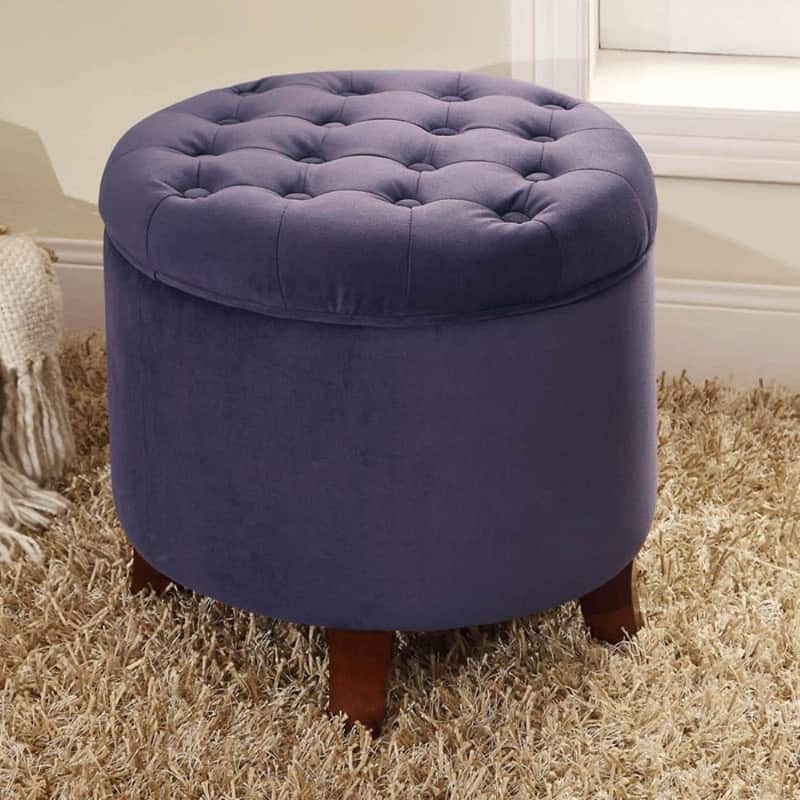 The Kinfine Round Storage Ottoman is a civilized addition to your living space or bedroom. It features a lift-off top and has ample storage space within. This ottoman is made with a sturdy wood frame and has a tufted, cushioned top that makes it useful as an extra seat or comfy ottoman. Comes in select color options. The teal geometric pattern of the Kaia delivers a classic look in a unique, new shape. 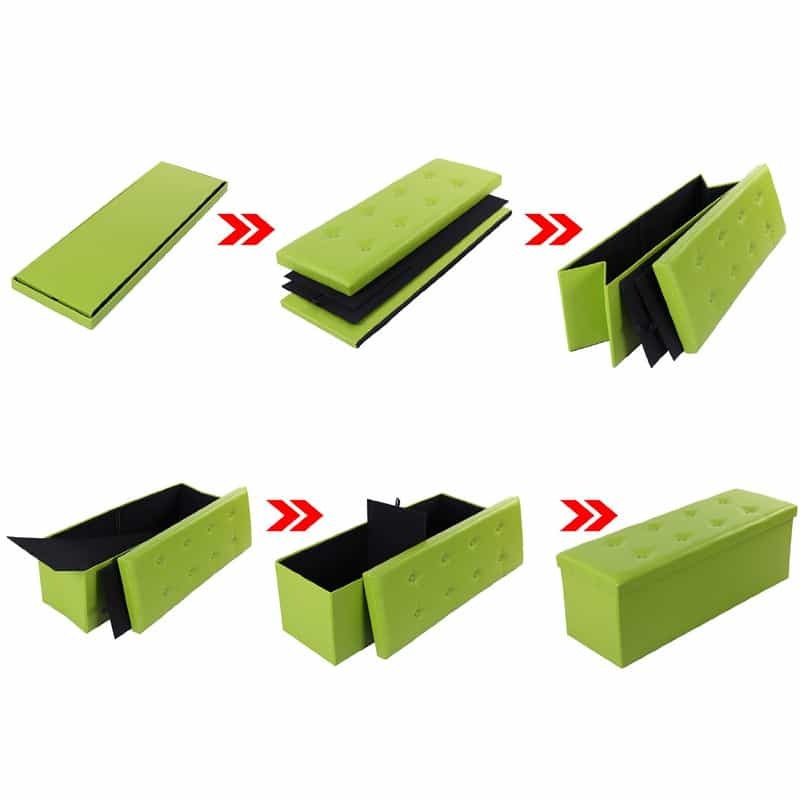 Plus, the versatile design works as a pillow, seat or ottoman for modern fashion. 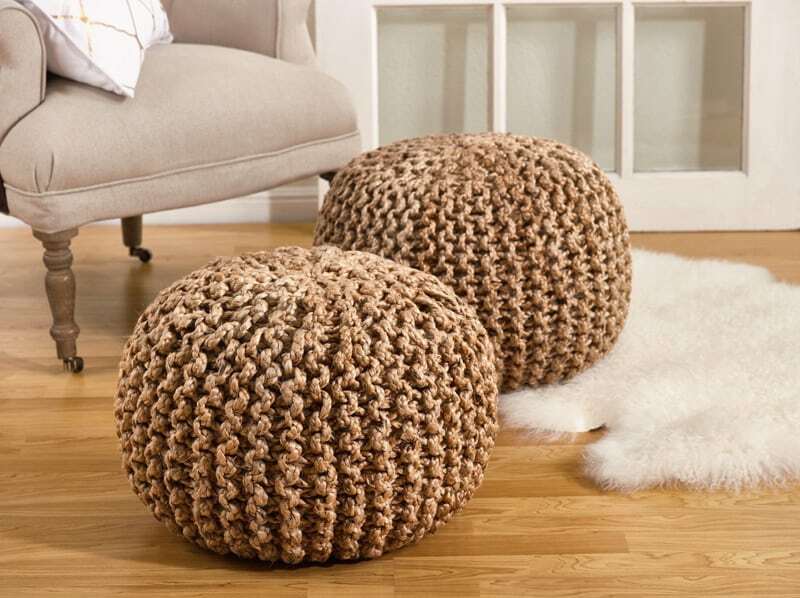 Chic and fun knitted jute pouf ottoman great for living areas, TV rooms and nurseries in natural color. 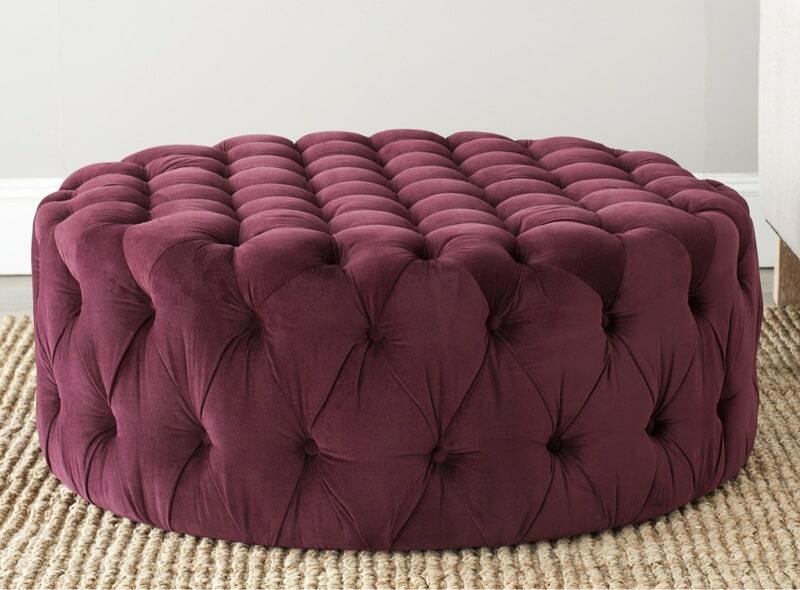 This delightfully vintage storage ottoman features a classic, button-tufted surface. The royal Grey velveteen upholstery is highlighted by a row of gold metal brads around the base, and deep brown, tapered legs. The top lifts off to reveal a large storage space within. At nearly four feet long, this unique, old-fashioned piece looks great in the front hallway, in the master bedroom, or in the livingroom, and suits many different decor styles. 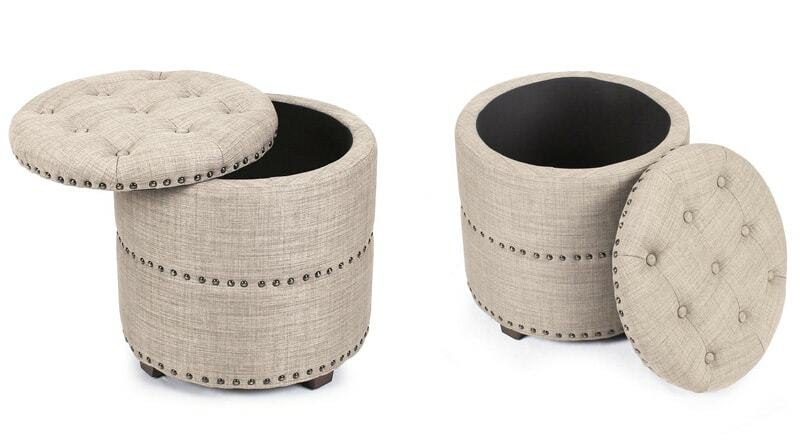 The Marley beige velvet pouf ottoman adds a contemporary yet playful touch to your living room, bedroom or entryway. Featuring buttery soft velvet, the comfort of a high density foam padding, and the style of all around button tufting, sturdy plastic feet for support, this adorable pop of color accent piece can be mixed and matched, and provides not only functionality but also a focal point of style and flair that seamlessly incorporates your main decor to create an inviting and comfortable atmosphere to come home to. 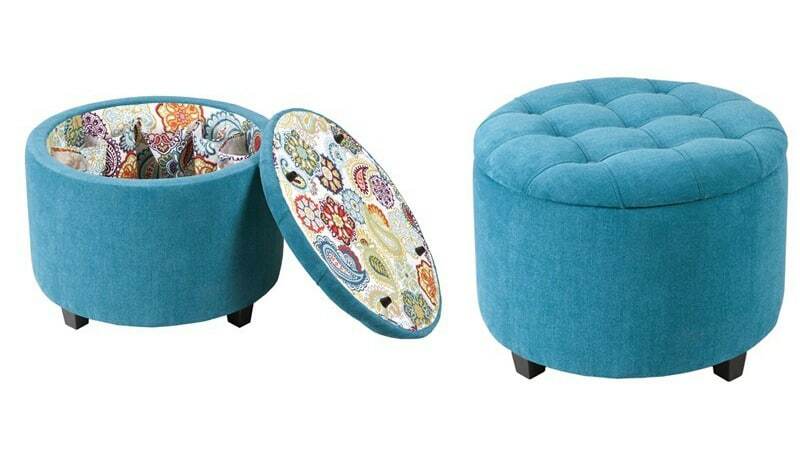 This round ottoman is ideal for additional seating in kids and teens bedrooms. 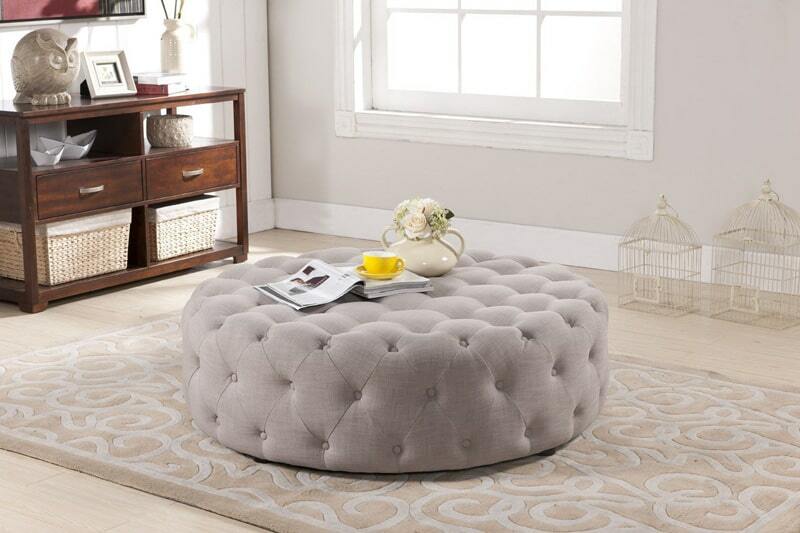 This mid century, button tufted round ottoman offers storage possibilities along with its sleek look. 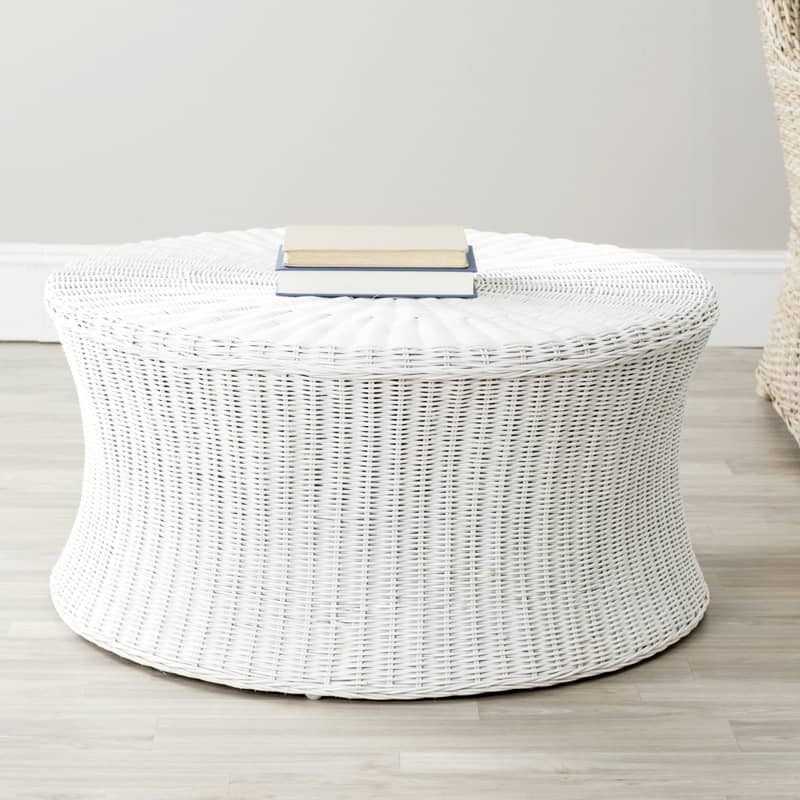 Bring the outdoors in with the woven rattan Safavieh Home Collection Ruxton White Ottoman, a transitional design that adapts to any decorating style from traditional to contemporary. With its low profile concave form and pure white finish, Ruxton can be styled as a coffee table or cleared for use as extra seating or a footrest. 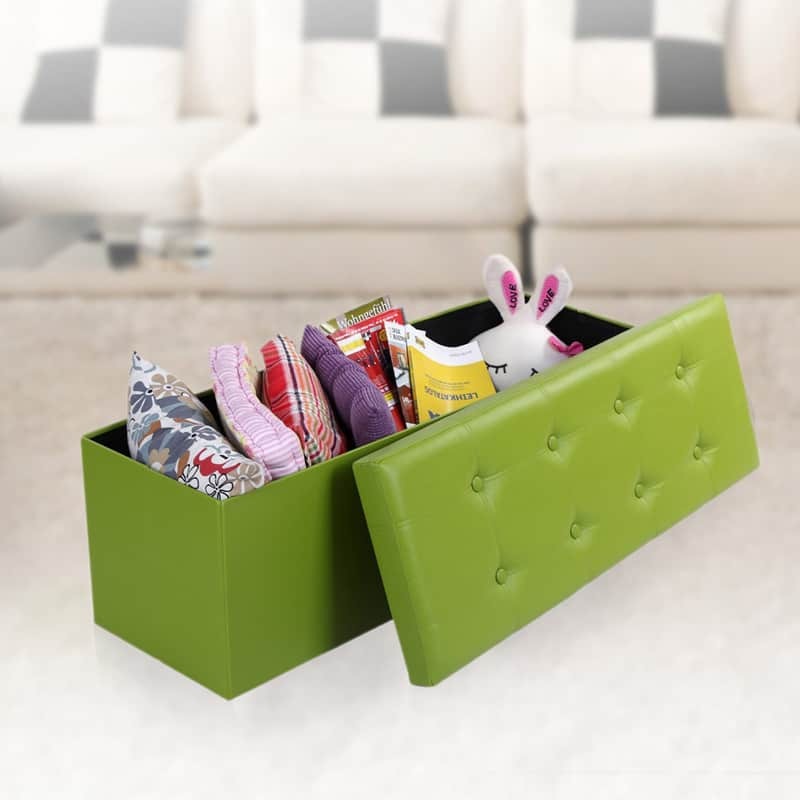 This square storage ottoman is attractive with its elegant tufted details and versatile storage option, making it a great addition to any room in your home. Featured in a muted sandy gold fabrication color. 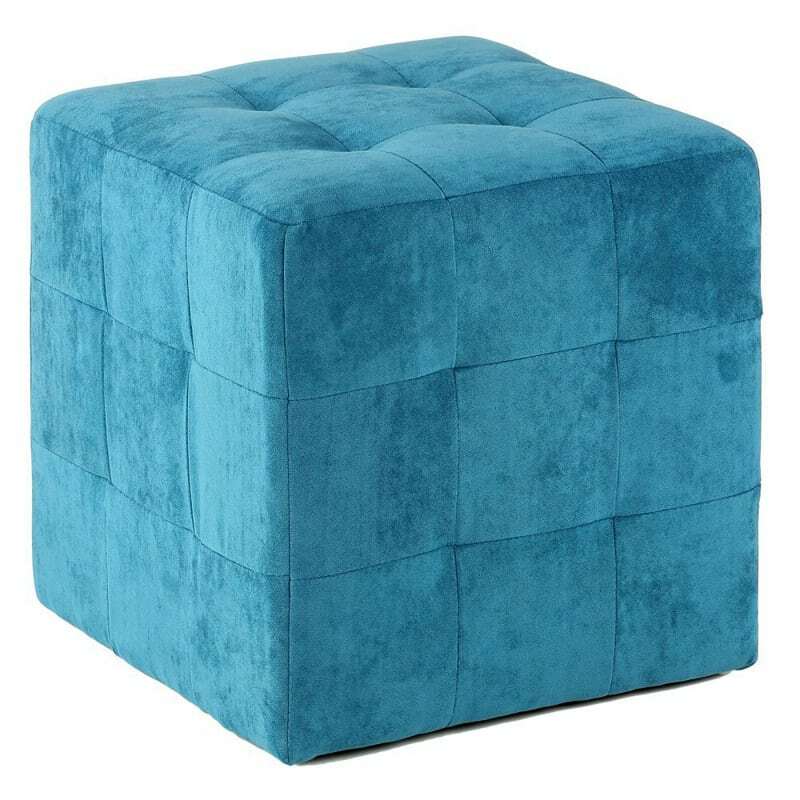 The Braque Blue cube ottoman with its warm calming blue color is an easy way to update the look of your home. It is upholstered in an blue microfiber with square tufting, it also features plastic non marking feet.